On World Mental Health Day, Dr Gregory Keane, Mental Health Referent for the Middle East, describes the challenges of assisting people in some of the world’s most severe conflicts. 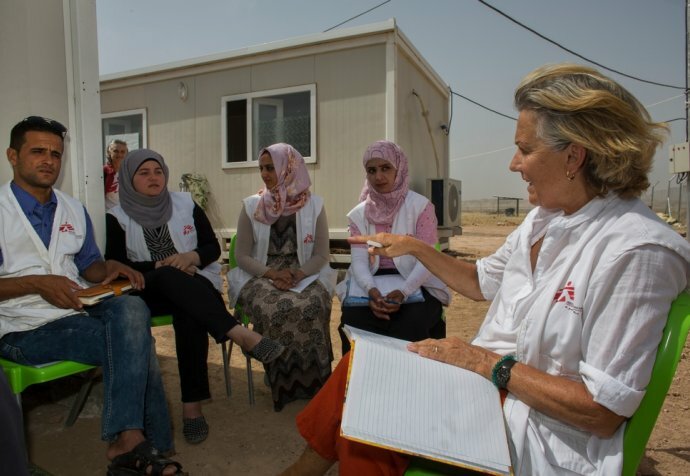 Dr Keane is a psychiatrist from Sydney, who develops the mental health components of Médecins Sans Frontières' projects in countries including Syria, Iraq, Jordan and Yemen. In the first half of this year, Médecins Sans Frontières led a mental health response to the huge movement of people coming out of Mosul. Mums, dads, kids, grandparents – finally leaving a place where they’d been trapped. Imagine the strength, innovativeness and internal resources you’d need to get you and your family out from a situation like Mosul! They finally make it out, then have to face the extremes of cold and heat in overcrowded tents. The first thing to say is that people have more resources – and manage much better with disaster and conflict – than any of us who haven’t lived through that might imagine. A significant majority of people in fact don’t need mental healthcare. There’s a difference between experiencing stress, which is very common in these situations, and then suffering to the point that you need some sort of intervention. "That day I diagnosed a young man with his first presentation of a psychotic illness, convincing his devastated mum and dad that he wasn’t possessed by a genie – that medication might help – and that things could be okay for them"
That said, there was a huge demand for mental healthcare during the Mosul crisis. I remember one day, in a 45-degree tent, everyone literally dripping with sweat. Person after person clamouring for mental health support for them or their families. That day I diagnosed a young man with his first presentation of a psychotic illness, convincing his devastated mum and dad that he wasn’t possessed by a genie – that medication might help – and that things could be okay for them. Then organising a follow-up appointment. I held 14 separate consultations that day in that tent – while our psychologist and counsellor saw their own patients as well. And we were just one of 11 different clinics (composed of counsellors, psychologists, general doctors and psychiatrists) that our team managed that day across various camps for internally displaced people. Video of Iraq: What type of mental healthcare do refugees need? To be clear though – it’s easy and satisfying when you can do something. What’s much harder is when you’re faced with problems that you aren’t directly responsible for managing, like ensuring people have enough food to feed their families. Thankfully in the Mosul response there have been a lot of NGOs providing all sorts of assistance. Will these conflicts have impacts for many years to come? I hope not, but the risk is definitely there. Chronic conflict does harm in so many ways. The longer a conflict draws on, and the worse the violence, the deeper the harm. In Iraq, people have faced decades of conflict and sometimes multiple displacements. Syrians however, depending on the severity of the violence they have faced, may be more likely to return to normal functioning earlier, since before the war they had a mostly stable and secure country with intact families, communities and support structures. The best thing that could happen, of course, is that conflicts are ended quickly and people are able to rebuild their lives. But that’s no easy feat! In the meantime, Médecins Sans Frontières is doing all we can to provide the best mental health outcomes for our patients.